I come from a family that is not just un-athletic. We are almost anti-athletic. Somewhere along the line, we got the idea that the “real” stuff is done with your mind. Athletes, we figured, were mean guys who poured kegs on peoples’ heads and acted like gorillas. (This stereotype persisted forever in my mind, despite the fact that literally every athletic person I’ve ever know has been warm and encouraging and kind to me). Anyway, it was very weird when my older sister married an… active guy. Mike would run marathons and do back flips and climb things just to prove he could… while Wendy would yell “Miiiicheaaallll!” Sharply from the ground, and implore him to be careful. I looked up at Mike, who was now trying to back flip off of the metal thing. Seemed to me like Mike was a walking case of about-to-be-selected-out-of-the-gene-pool if there ever was one. My dad then cocked his head to the side and observed Mike with that same expression he used when he hooked up the microscope so we could all look at that algae slime he brought home from the swamp and grew in the music room until mom threw it out. Stereotypical masculinity was not prized in our household. If you knew Mike, you would laugh at my describing him as the poster child for “stereotypical masculinity”. Mike has an earring in each ear, loves to cook, and stayed home when his kids were little and ran a daycare. But… he also does things like CityWalk. Which is the yearly pilgrimage where bunch of questers spend the day (from about 4:30 a.m. to about midnight) walking around the city. To prove that they are strong in body and in mind. This has always seemed foreign to me, as I come from a family where you prove you are strong in mind by displaying your detailed knowledge of Shakespearean dialogue scenes, and maybe reciting digits of pi. And you prove you are strong in body by eating actual pie. And maybe moving some furniture (we are not athletically inclined, particularly, but we have ox-moose genetics, and we like to re-decorate. Also, we have to do something to burn off the pie). I have never been able to understand the mystical force that drew my sons to Mike and his adventures. Despite my perfectly adequate education on masculinity with appropriate footnotes to all the relevant Darwinian concepts, they were all somehow drawn to a more hands-on kind of learning. Enter CityWalk. When it began, it was 67 kilometres. Last year, it clocked in at 80 kilometres. For my American readers, 80 kilometres, in metric, is bonecrushing-freaking-holy-hanna-forever. About 16 hours. But it feels like 37 hours (or so I'm told). It is a kind of pilgrimage… or, what a pilgrimage would be if you weren’t actually going anywhere but just walking in a big circle and ending up where you started. My description is not doing this 24 year tradition justice. Ten days before, Mike published the details for this year’s city walk on his blog, including logo with a clearly sarcastically intended comment about how we could all make t-shirts. Since the logo accidentally originally read “City Walk 2019”, David (my adult son) immediately began researching how to get said t-shirts made…. But couldn’t get them in time for the momentous occasion. Some walk once. Some, like David and Bri (David’s wife) walk year after year. Some for five blocks, some for thirty kilometres. They bond, they struggle, they test the limits of their bodies and their minds. (In Eric’s case, they are pretty comfortable with their knowledge of their limits already, so they just follow along in a car with First Aid supplies and helpful tips about hydration). I am also pretty comfortable in my knowledge of my own limits (I have always been part of the support team as well), but somehow Anthony enlisted me to prove myself alongside him this year. At 4:15 a.m., the alarm went off. That was when I first came face to face with the knowledge of my own limits. I yelled “I was unprepared for this level of hardship!” and rolled over and tried to go back to sleep. Fifteen minutes later, I trudged grumpily along beside my son, who was leaping rocks and making motions like he was punching the air with his fist. 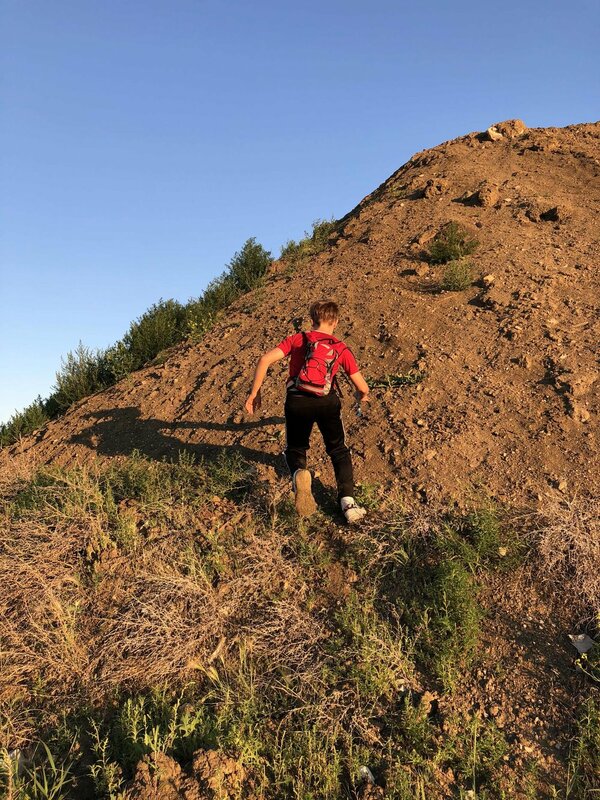 I began a discussion with Bri about how I never really understood how to teach healthy masculinity to my sons, which ended when Bri pointed out, laughing, that while the three female hikers were plodding along talking about this topic, the three males and randomly climbed to the top of a big hill of dirt. “Good masculinity-ing, honey!” I yelled to Anthony. Bri shook her head. I was going to, but just as I took a breath to speak, Anthony tipped forward. He began what he insists was a “controlled descent” and looked to me like a terrifying fall. I watched in slow motion as he plummeted for the rocks at the base, landing knee first on one of the stones, with the full force of his body and the fall behind him. He lay, curled around his knee, his face a distortion of pain. Injured. One hour into the walk. He tells me he was thinking “I was hoping to make it half way but instead I only made it half an hour”. I pointed out that it was an hour an a half or so. He said he knew that, but he was doing word play and the story is better this way and leave him alone. The apple does not fall far from the tree. Or, in this case, the son does not fall far from the giant pile of dirt that there was no point in climbing in the first place. We circled him as he slowly uncurled himself and took deep breaths. He struggled to his feet, and then he put his weight very gingerly on his leg. I watched his face, trying to distinguish if I had to stop him from continuing the walk. After a couple of minutes, we decided he could try, and see how it went. I told Anthony about half a dozen times over the next ten minutes that we could stop any time he wanted. Mike told me to cut it out, and that I was supposed to channel my pirate-spirit. My mother-spirit was supposed to wait until the thirty mile mark. To be honest, I am not long on pirate spirit—unless someone wants to discuss decision making processes on pirate ships and how they pareleled New England congregational polity. Which, interestingly, nobody ever wants to do. I weighed possible masculinity-encouraging phrases such as “Great strength of mind, honey—that will lead to good positioning in masculine dominance hierarchies in later life”, but in the end decided not to say much about it. Which is good, because according to Mike it is not as much about that swamp-algae thing that my dad explained as it is about knowing yourself, learning what you can do, and growing as a person. To be honest, I was surprised that Anthony was so interested in City Walk. Until a couple of years ago, he was way more of a jazz hands kind of guy. Then, he began this transformation… setting goals and working towards them. Getting kinda cheeky and know it all. Punching air for no reason. That sort of thing. I have raised enough kids to know that when the Thirst To Strain Against Your Limits presents itself, it is best channeled into productive strain before it is channelled into Dumb Stuff. So we’d trained. We’d walked for hours and hours and HOURs. Well, an hour anyway. Most days. Sometimes more than one hour. For ten whole days of training. It was exhausting. I had to buy many fruit snacks for energy. You know, the type of fruit snacks where the main fruit included is corn. In the form of syrup. I am better built for less active types of coaching, such as writing notes to Facebook. Which I did, so that people could write encouraging things. Anthony said he didn’t want encouraging things… that he was most motivated by proving he could do it to people who were skeptical. His actual words, I believe, were “I am motivated by hate and vitriol”. I suggested he move over to the YouTube comment section, then, but he was not listening because he was forcing himself forward with great determination on his sore knee. While I walked nervously behind him, wondering if I was making a huge mistake not to pull him from the adventure due to his fall.